TThe Pololu dual high-power motor drivers are compact carriers for the VNH3SP30 and VNH2SP30 motor driver integrated circuits from ST. 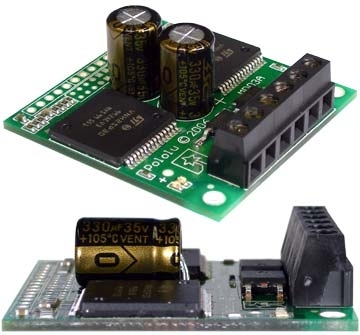 The board incorporates most of the components of the typical application diagram on page 8 of the VNH2SP30 datasheet, including pull-up and current-limiting resistors and a FET for reverse battery protection. (The current sense circuit is populated on both versions of the board, but only the VNH2SP30 supports current sense.) To keep the number of I/O lines down, the two enable/diagnostic lines on each chip are tied together. All you need to add is a microcontroller or other control circuit to turn the H-Bridges on and off. 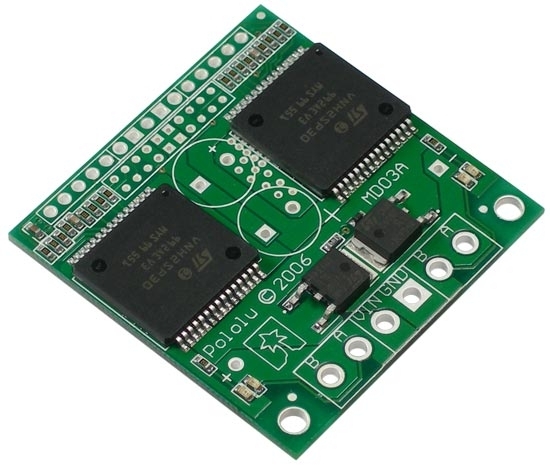 Please note that we offer several other products based on these same chips, including single carrier boards for controlling one motor, the qik 2s12v10 dual serial motor controller, the TReX motor controller, the jrk 12v12 USB motor controller with feedback, and the Orangutan X2 robot controller. We also have a family of higher-power motor drivers that can deliver more current over a wider operating voltage range. In a typical application, the power connections are made on one end of the board, and the control connections are made on the other end. 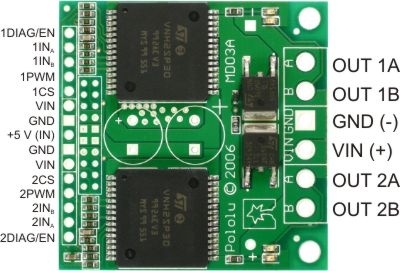 +5 volts must be supplied to the board through the smaller 0.1"-spaced pins; the input voltage is available at those pins as well, but the connection is not intended for currents exceeding a few amps. The diagnostic pins can be left disconnected if you do not want to monitor the fault conditions of the motor drivers. 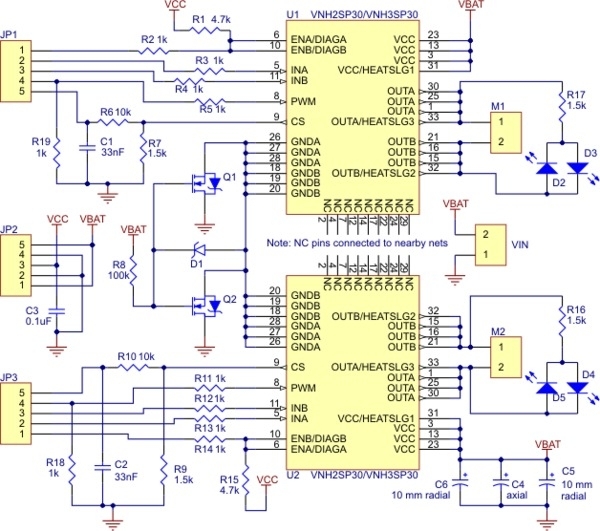 INA and INB control the direction of each motor, and the PWM pins turns the motors on or off. For the VNH2SP30 version, the current sense (CS) pins will output approximately 0.13 volts per amp of output current. If you want to add current sensing to the VNH3SP30 version, or if you want higher-accuracy current sensing with the VNH2SP30 version, please consider our ±30A ACS714 current sensor carrier. The dual motor driver PCB includes provisions for installing up to three large capacitors to limit disturbances on the main power line. Two 10mm radial capacitors may be mounted between the motor driver ICs, and an axial capacitor may be mounted between the ICs and power connections. It is generally not necessary to use all three capacitors; two radial capacitors are included with each unit. For applications that require a low profile, a single capacitor can be installed on its side as shown in the picture to the right. 1. The datasheet claims a maximum of 36 V, but shoot-through issues make operation impractical above 16 V.
2. There are unprotected electrolytic capacitors that will be damaged by reverse voltage.